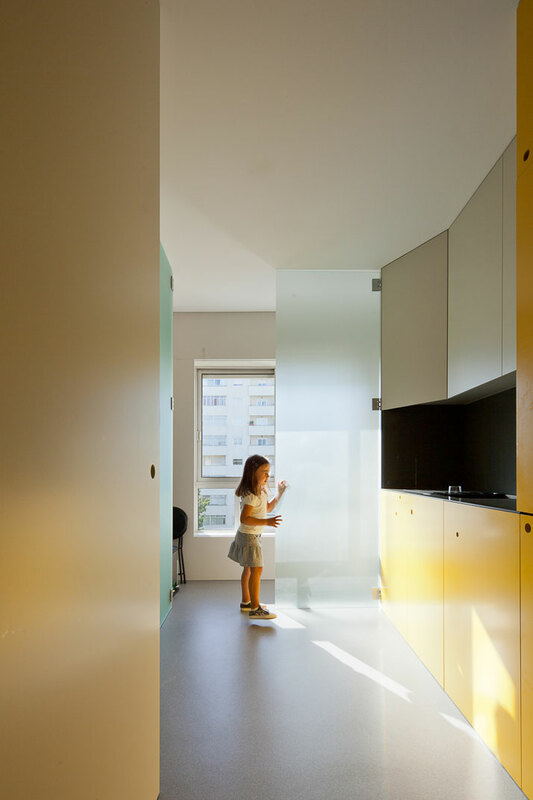 Portuguese architects Pedro Varela and Renata Pinho have recently completed the renovation of an apartment in Portugal. For this old apartment that had to deal with very specific issues, the result is very yellow, pop style, 1970’s inspired with playful shapes and geometric volumes. 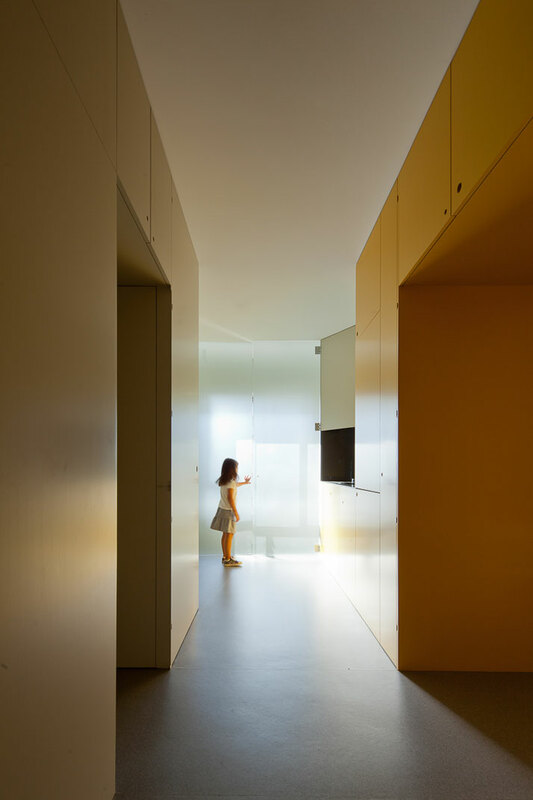 Of course, the main element throughout the renovated apartment is the large yellow storage piece which is totally transformable and also acts as a partition between the communal spaces. Explore this project’s architecture and design solutions in Portugal exclusively on Yatzer. The architects had to project the redesign of the apartment which had to deal with programmatic and design related issues, which were very specific. They had as main tasks to replace the existing floor, redesign the kitchen - while keeping the laundry space - and create abundant storage space which is always necessary in limited sized apartments whereby the bathrooms and the master bedroom intervention is a welcome bonus to what was essential throughout the redesigning process. 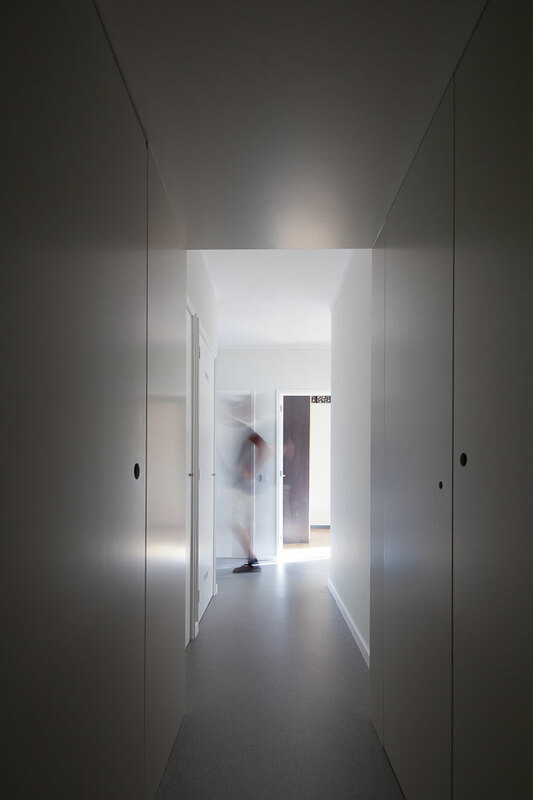 Upon entering, one of the first things you notice is the natural rubber flooring in a light grey tone which has replaced the former flooring and runs throughout the residence. 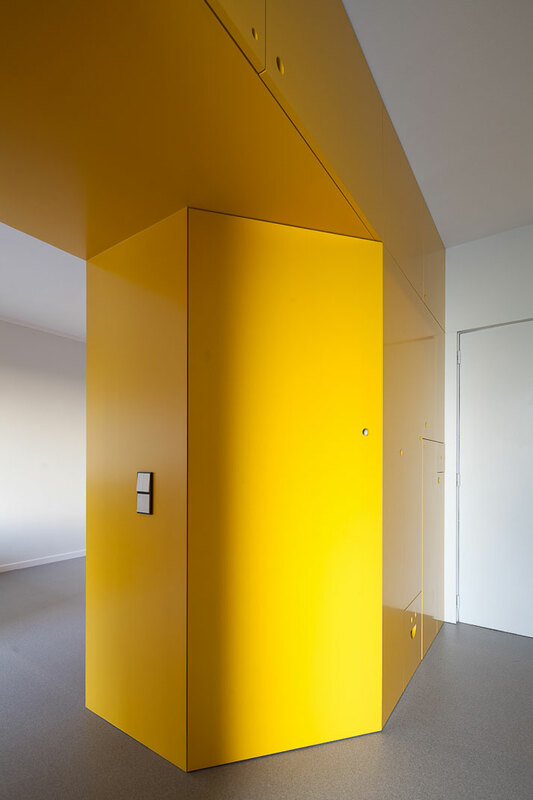 A large cadmium yellow constructed storage centerpiece runs from one wall of the apartment to the other,interrupted by a void passageway which leads to the remainder of the apartment. At first glance, the never-ending cadmium yellow centerpiece looks like a storage space, however this is not entirely the case; this large centerpiece is multi-functional and acts as a partition, a storage space and an entirely transformable kitchen! 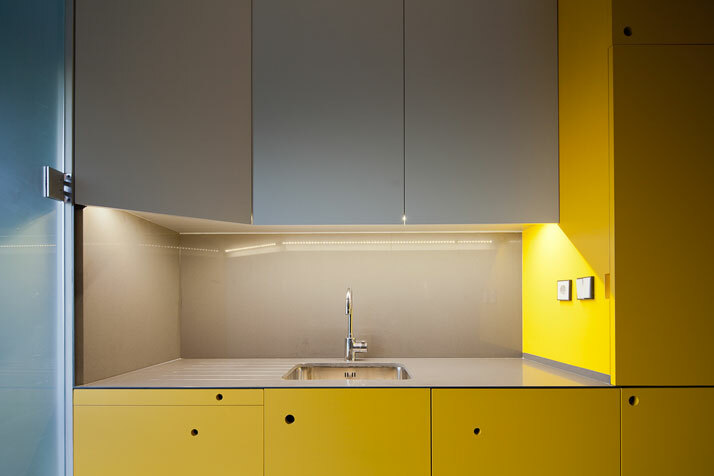 On one side of the cadmium yellow volume, the architects have positioned the kitchen, which according to the architects is ''like a big flipping machine, with a replaceable counter, convertible laundry room and hidden storage in a clean layout.'' Due to the fact that the kitchen has no walls, apart from a glass partition flipping door, and it is entirely opened plan; the truth is that it had to be designed in such a way as to provide for a clean layout solution. 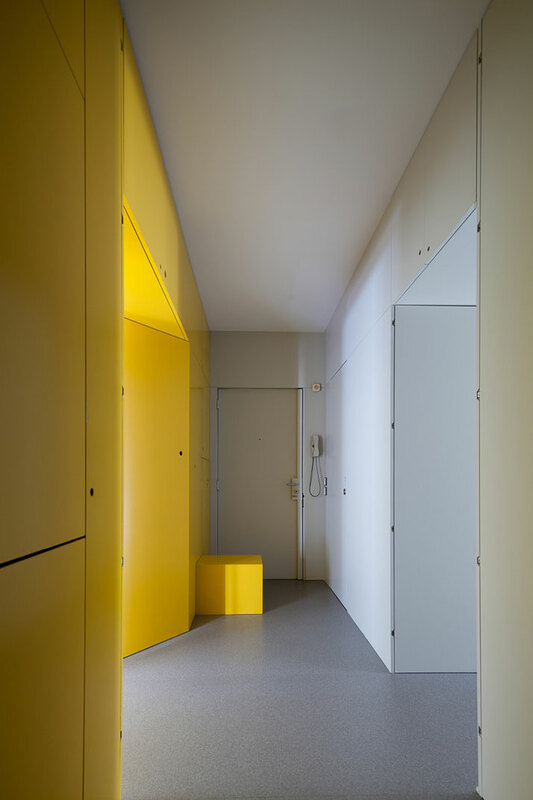 A void suggestive of a door interrupts the large cadmium yellow volume and acts as a passageway to explore the remaining communal space. 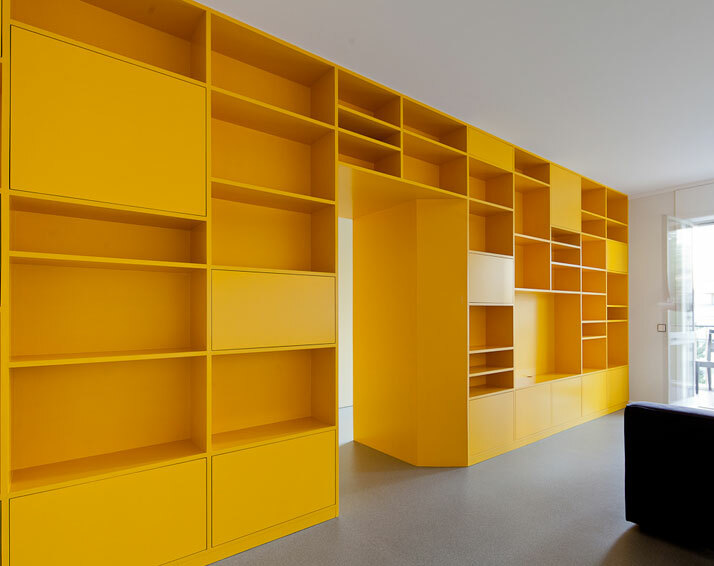 On the other side of the large cadmium yellow volume is the living room; the partition is now transformed into a large storage space volume which takes the form of a bookshelf, a TV stand, and much more. The geometric shaped volume has playful solutions which have different functions, as well as ''asymmetric round holes substituting knobs, and a smiley face substituting a handle, are carved in a yellow closet which is the project's inner core'' - happy, smiling people! On the other side of the apartment, in-line with the void passage-way, one finds the apartment’s private quarters. 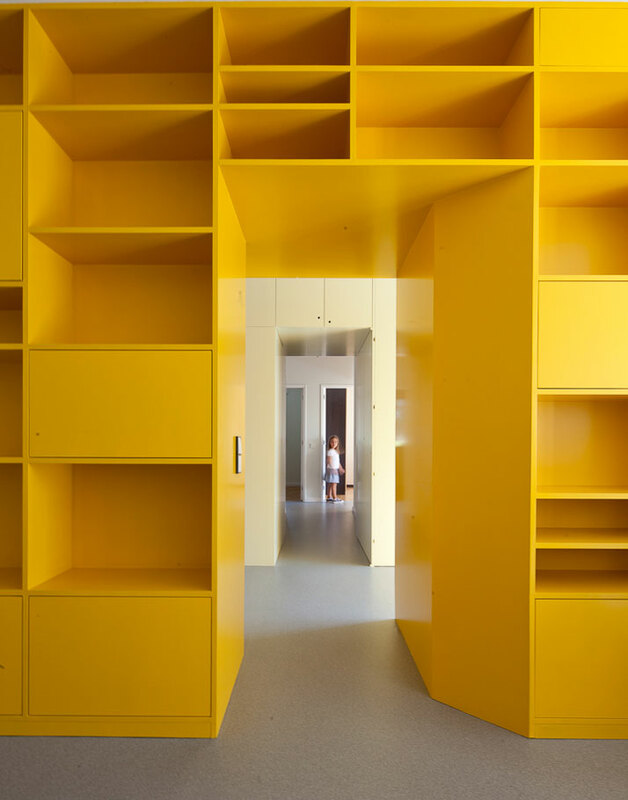 Once again, the walls are wooden constructions –this time in a neutral tone so as not to override the cadmium yellow multi-functioning partition’s centerpiece. The wooden walls become closets and other storage space furnishings thus giving a feeling of a somewhat larger space. 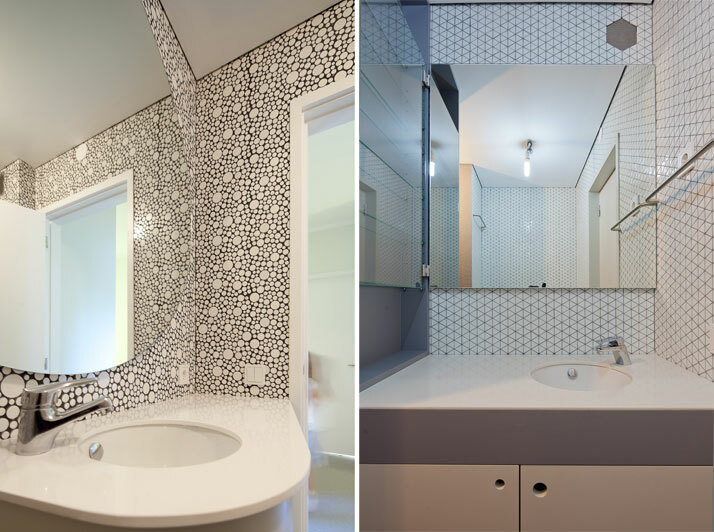 The passageway leads to the bathrooms which are tiled in two different geometric themes; however both seem to have a pop-style, and a very retro 1970s mojo. On the other hand, in the master bedroom IKEA furniture has been complemented with wood giving a feeling of a very tailored yet affordable master bedroom which is casual and laid-back in style and nevertheless sophisticated. In conclusion, architects Pedro Varela and Renata Pinho have designed a functional space, which seems to have been completed on a low budget. 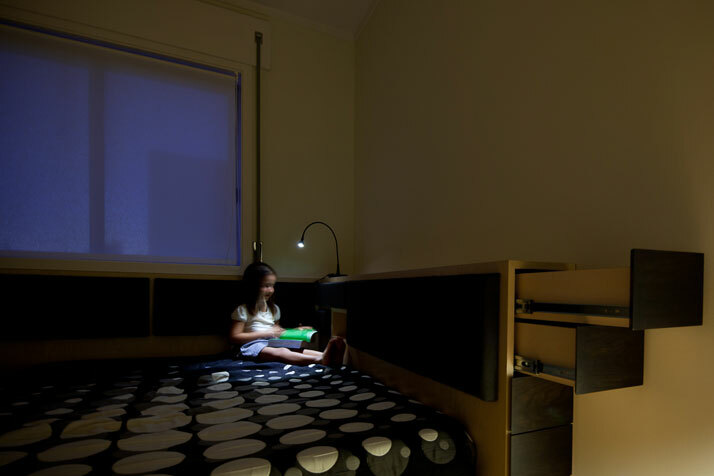 It’s playful, functional, and takes full advantage of the ‘lost’ spaces within an apartment. However, undoubtedly our favorite piece within this residence is the cadmium yellow centerpiece which multi-functions and supports various uses.